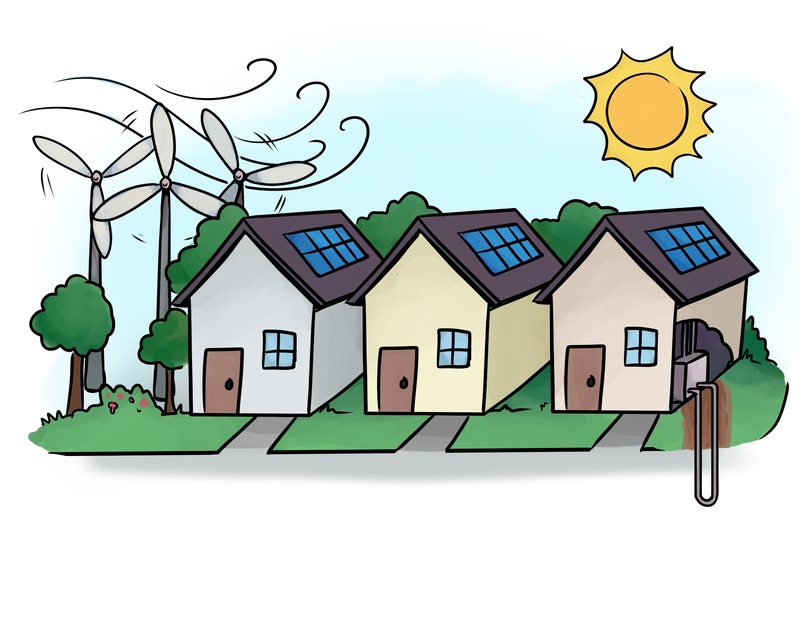 THE WIND, SUN AND TIDES are all great sources of clean and renewable energy, but you have to take what you can get when the sun is shining, the wind is blowing and the waves are rolling. Geothermal is always there for us, so what gives? Where are we with this mysterious technology? THE US DEPARTMENT OF ENERGY (DOE) says that geothermal energy, a virtually untapped energy resource derived from the earth's heat, is more vital today than ever—it supplies clean, renewable power around the clock, emits little or no greenhouse gases, and takes a very small environmental footprint to develop. By developing, demonstrating, and deploying innovative technologies, GTO's efforts are helping stimulate the growth of the geothermal industry within the renewable energy sector and encouraging quick adoption of technologies by the public and private sectors. Jeffery Tester of Cornell University in NY says that the total amount of [energy] at accessible depths has been estimated to be on the order of 10 billion quads (a quad is the energy equivalent of about 180 million barrels of oil and 90 quads represents the total US energy consumption in 2001). This is about 300 times greater than the fossil fuel resource base that includes all petroleum, natural gas, and coal. (Tester, et al. 1989). Hydro-thermal. Like the familiar “Old Faithful” geyser in Yellowstone National Park, hydrothermal power provides super-heated water to drive electrical generation turbines. Enhanced Geothermal Systems. This is “hot, dry rocks”, and usually quite deep that require water to be pumped down to the source where it is turned into steam to drive electrical generation turbines. Geothermal, Deep Direct Use (Hot Water). This is water that is hot enough straight out of the earth to provide building heat, domestic hot water, and anything else below about 200F. 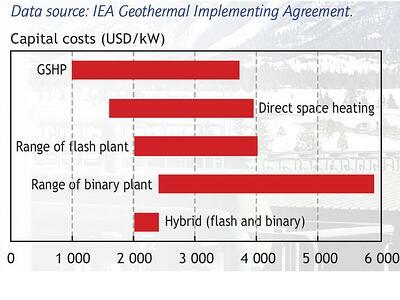 Geothermal, Low Temperature and Co-Production. This is the least understood and yet a promising and useful technology. The DOE lists several electricity producing applications using binary, variable phase turnine power, Organic Rankin Cycle (ORC), and other exciting emerging technologies. Geothermal (Ground Source) Heat Pump (shallow neutral earth temps). This technology uses the energy available in the shallow earth, and pumps it up to a usable temperature for heating (and cooling). 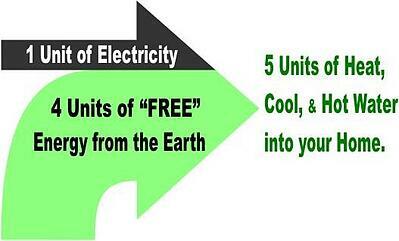 This is super-efficient considering the heat pumps use only about 1 unit of electricity to pump 4 units of heat. To help us understand how this energy from inside the earth can be harnessed for electricity, a brief geology explanation is in order. Inside the earth, at its core, is a layer of hot and molten rock, called “magma”, which constantly produces heat from decayed uranium and potassium. It is this magma that we see in volcanic eruptions. 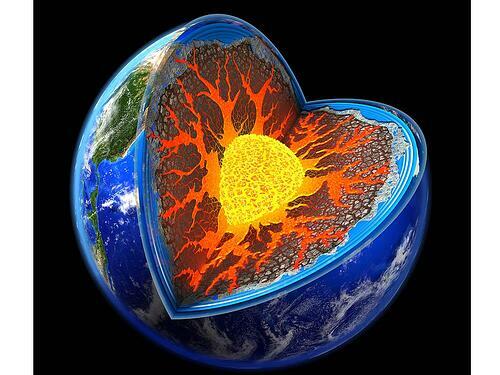 Above the molten core at the center of the earth is the earth’s mantle: the mantle is that portion of the earth, about 1,800 miles thick, between the earth’s core and its crust. The earth’s crust is a blanket of insulation; geothermal is the "power-plug"
The earth’s crust and mantle are called the “lithosphere”. The lithosphere is broken up into massive tectonic plates that cover the entire surface of earth – to include the continents and the oceans. These plates move in very slow motion against each other constantly, and produce earthquakes, volcanic eruptions, mountain building and oceanic trench formation at their plate boundaries, as a result of their motion. The highest underground temperatures occur at the plate boundaries, and these “hot spots” are where we see active volcanoes, seismic activity, and hot water springs. Magma movement travels upward through fluid conduits in the earth’s mantle and up through the crust. In volcanic eruptions the magma lava is blown out of the center of the volcano with tremendous force; in places where hot spots are constant, heat is released in the form of hot water and steam. The temperature of a geyser’s water can be more than 430°F (200°C). These less powerful eruptions we call geysers, and the hot water and steam they emit are a form of untapped geothermal energy. That energy can be captured and used to power turbines to produce electricity. By drilling wells into the underground hot water reservoirs that feed geysers, we can bring up hot water or steam to the surface and use it to make electricity. Conventional geothermal technology entails the production of useful energy from natural sources of steam or, much more commonly, hot water. These hydro-thermal resources are found in a number of locations around the world, but they are the exception rather than the rule. In most places, the earth grows hotter with increasing depth, but mobile water is absent. 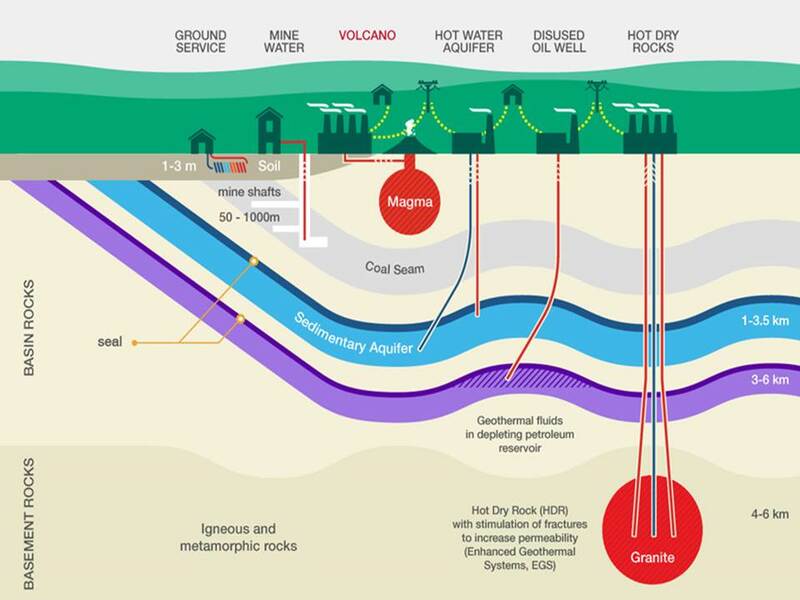 The vast majority of the world’s accessible geothermal energy is found in rock that is hot but essentially dry -- the so-called hot dry rock (HDR) resource. As mentioned previously, the total amount of heat contained in HDR at accessible depths has been estimated to be on the order of 10 billion quads (a quad is the energy equivalent of about 180 million barrels of oil and 90 quads represents the total US energy consumption in 2001). Again, this is about 800 times greater than the estimated energy content of all hydrothermal resources and 300 times greater than the fossil fuel resource base that includes all petroleum, natural gas, and coal. (Tester, et al. 1989). The first example of producing geothermal electric power occurred at a plant in Italy in the early 1900’s; additional plants were then built in Japan and in California. Today, geothermal electric power is generated by plants operating in over 20 countries. 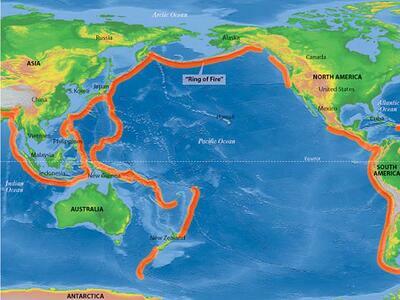 Countries along what’s known as the “Ring of Fire” that circles the earth have the best ability to harness geothermal energy for electricity production because they lie atop tectonic plate boundaries as mentioned previously. That is why countries like the Philippines, Indonesia and the United States are leading producers of geothermal electric power based on their installed megawatt (MW) capacities. In a country like Iceland, which is a volcanic island, geothermal electric power provides most of the electricity and hot water used by Icelanders. It is estimated that the amount of heat within 33,000 feet (much of the energy at this depth may be considered too deep for reasonable access) of the earth’s surface contains 50,000 times more energy than all of the oil and natural gas resources in the world. A geothermal resource requires fluid, heat, and permeability to generate electricity. Conventional hydrothermal resources contain all three components naturally. These geothermal systems can occur in widely diverse geologic settings, sometimes without clear surface manifestations of the underlying resource. The lack of ability to accurately predict temperature and permeability at depth from the surface is a major cause of exploration risk. Additionally, subsurface characterization and imaging are critical for the efficient utilization of all types of geothermal resources, including low temperature and co-produced, permeable sedimentary and enhanced geothermal systems. 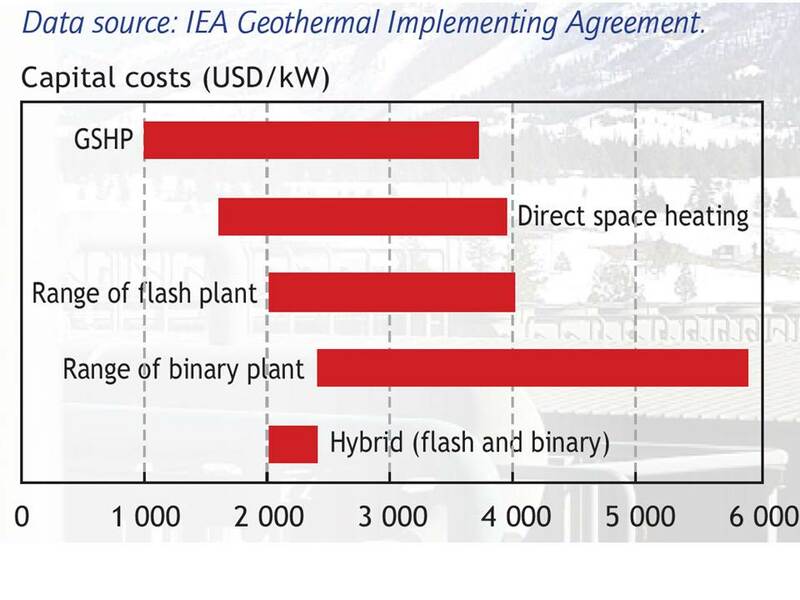 The US DOE’s Geothermal Technologies Office is also focused on reducing the operations and maintenance (O&M) costs of hydro-thermal systems. EGS are engineered reservoirs created to produce energy from geothermal resources that are otherwise not economical due to lack of water and/or permeability. EGS technology has the potential for accessing the earth's vast resources of heat located at depth to help meet the energy needs of the United States. This is what people generally understand geothermal energy to be; lava-hot temperatures that turn water into pressurized steam that drives turbine powered electric generators. Deep Direct Use (DDU) geothermal applications utilize natural geothermal fluid for a full spectrum of cascading uses, including district heating and cooling, commercial and residential applications, industrial processes, and agricultural uses. 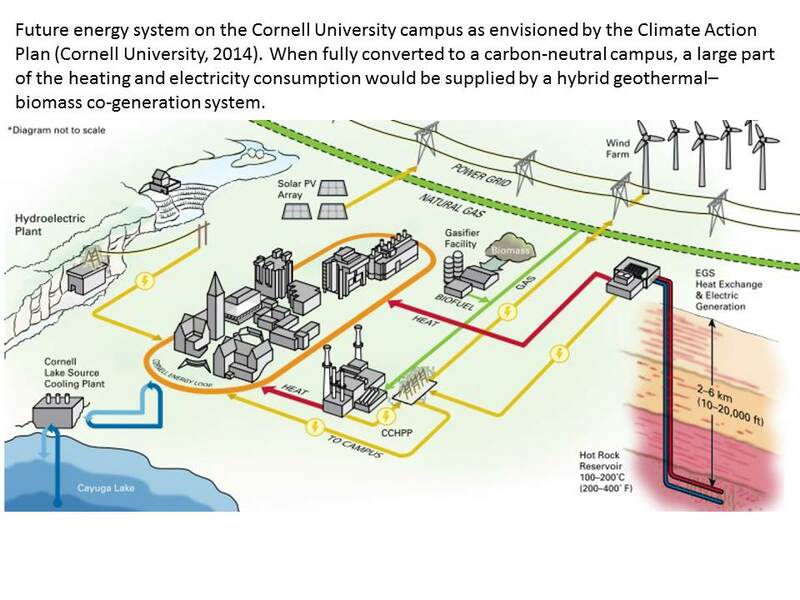 As the demand for net-zero energy campuses, military installations, and offices increases, DDU offers great opportunities to significantly expand the impact and reach of geothermal energy to a much wider swath of the country. These lower temperature geothermal applications are inviting for near-term deployment and could provide a large fraction of the energy demand currently supplied by high-grade fossil fuels. What is Deep Direct Use Geothermal? DDU is an emerging technology area in the geothermal sector that draws on lower temperature geothermal resources that are shallower than most conventional hydrothermal resources. Deeper than geothermal heat pumps (GHPs) and other conventional direct use systems, DDU is deployable at a similar temperature range (40 C - 150 C) but at a much larger scale. DDU maximizes system efficiencies and return on investment. This new technology could result in large scale, low temperature geothermal applications in a much wider swath of the country, including the Eastern United States. Deep Direct Use Geothermal is the use of deep reservoirs of heated water that are of sufficient temperature to be used directly for building heat and domestic hot water (DHW). Typically wells are drilled in pairs; one supply and another for return once heat has been extracted (called “doublets”). 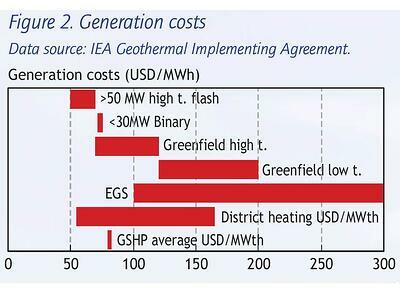 Direct Use Geothermal is less expensive than HDR, and is practical in many regions where the heated aquifer resources are available. However, there is an even greater abundance of lower temperature geothermal than can be tapped using Enhanced Geothermal Systems (EGS). What is Geothermal, Low Temperature and Co-Production? 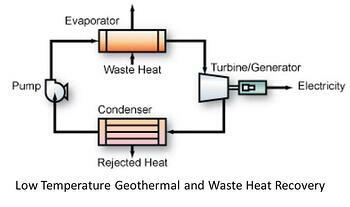 Utilization of low temperature (about 200F) geothermal resources and waste heat from turbines and engines used in industrial applications along with waste heat from industrial processes are exceptionally abundant sources of energy. If even a fraction of this waste heat could be economically converted to useful electricity, it would have a tangible and very positive impact on the economic health, energy consumption, and carbon emissions in the U.S. manufacturing sector. The current waste heat recovery technologies, including Organic Rankine Cycles (ORCs) and thermoelectrics, are technically feasible but economically unattractive. This limits their current use to a small number of niche applications.The DOE lists several electricity producing applications using binary, variable phase turnine power, Organic Rankin Cycle (ORC), and other exciting emerging technologies. 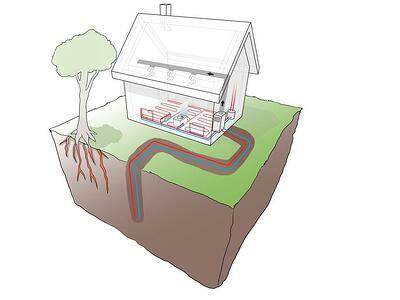 What are Geothermal (Ground Source) Heat Pumps? 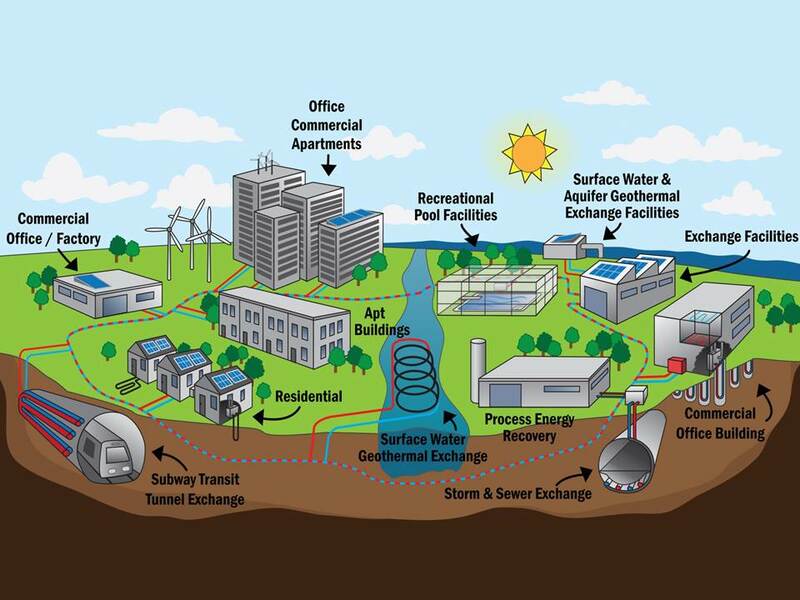 The DOE says that geothermal heat pumps (GHPs), sometimes referred to as GeoExchange, earth-coupled, ground-source, or water-source heat pumps, have been in use since the late 1940s. They use the constant temperature of the earth as the exchange medium instead of the outside air temperature. This allows the system to reach fairly high efficiencies (300% to 600%) on the coldest winter nights, compared to 175% to 250% for air-source heat pumps on cool days. Low-temperature resources represent a fast growing and proven sector of development in geothermal technologies. These technologies are bringing valuable returns on investment in the near-term, using proven heat pump technologies modify the shallow earth temperatures for delivery to homes and buildings for cooling, heating, domestic hot water, pools, spas and any other conceivable heating and cooling needs. The Geothermal Technologies Office (GTO) works with industry, academia, and national laboratories to develop and deploy new low-temperature technologies that will help the geothermal community achieve widespread adoption of under-utilized low-temperature resources. The US Environmental Protections Agency (EPA) recently published a website on GHP technology, and he Energy Department recently announced funding for research and development to help grow U.S. low-to-moderate-temperature geothermal resources and support a domestic supply of critical materials. While previous types of geothermal have varying availability and ability to provide energy resources to us, low temperature geothermal resources are available to practically everyone. Right below the earth’s surface (within just 6 feet) lays a heat source and heat sink that can be tapped by use of a Geothermal Heat Pump (GHP). According to the Energy Information Administration (EIA), GHPs use the relatively constant temperature of shallow ground (< 300 m deep) to provide space heating, cooling and domestic hot water. GSHPs lift heat from low-temperature ground or groundwater to a higher useful temperature. GSHPs come in two general configurations: vertical borehole heat exchangers and horizontal subsurface loops. Ground source heat pumps are now the fastest growing application of direct geothermal energy use, with about 3 million GSHPs installed at the start of 2010. Newer figures from Navigant show the 2015 numbers at over 6 million units and growing rapidly. In the same report the EIA shows GHP’s have the lowest capital cost and is competitive with operational costs (USD/MWh) of installed geothermal power plants. Tester, J. W., Brown, D. W., and Potter, R. M.: Hot dry rock geothermal energy – a new energy agenda for the 21st century, Los Alamos National Laboratory report, LA-11514-MS, US Department of Energy, Washington D.C., 1989.